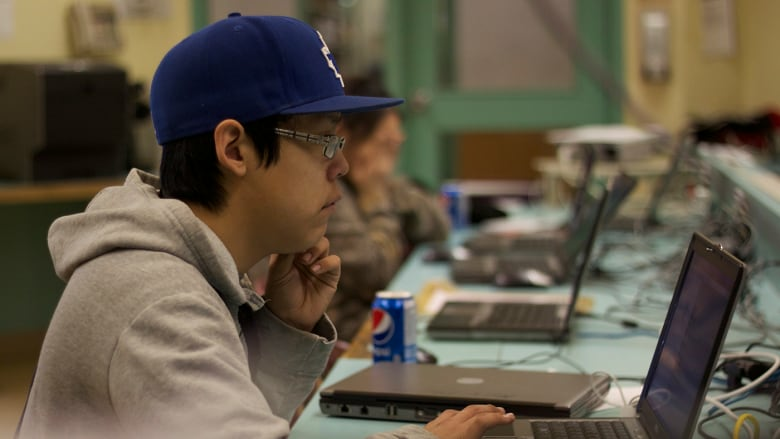 A novel approach to mental health has Arviat youth learning computer coding skills this week, giving them the ability to digitally tell their own stories. It's not every day that you hear adults telling kids that spending more time in front of computer screens could be good for their mental health. But this week, in Arviat, Nunavut, a novel approach to addressing mental health has students doing just that, as 16 youth participate in the territory's second ever Code Club. The club is being organized jointly by Pangnirtung, Nunavut game developers Pinnguaq and the Qaujigiartiit Health Research Centre, and has changed significantly since it was debuted last year in Pangnirtung, incorporating more Inuit and Nunavut culture. "When you can be provided with the tools to express yourself and tell your story, and to put people in your shoes through telling that story, it can be extremely healthy, and extremely therapeutic in a lot of ways," says Ryan Oliver, Pinnguaq's founder. Taha Tabish, a research coordinator with Qajigiartiit, is in Arviat this week with Oliver, evaluating the effectiveness of the program. However, he won't be using traditional evaluation metrics, such as formal surveys. Instead, he's taking a holistic approach. "We're all learning and laughing and coming together," he said, following day one of the camp. "I think, if anything, if we're talking about evaluation metrics, that's a good one." Oliver and Tabish see the use of computer coding as a way to teach youth new forms of storytelling, while at the same time being able to organically observe what it is they have to say. Pinnguaq recently developed Beneath Floes, an interactive storytelling game based on Inuit legends. Tabish says that although there are inner-city coding camps in larger southern centres, there is likely not a program like Arviat's Code Club anywhere else. Well, how can we look at tech in a positive way?" The coding club runs throughout the week in Arviat.